This versatile shoulder bag is hand-crafted by Chirada Loetparisanyu with cotton and leather trimming. 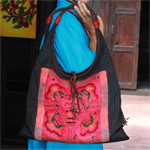 Its exterior features a fascinating decoration embroidered and stitched by hill-tribe women by hand. The interior is fully lined with cotton and boasts three large compartments. The central compartment closes with a zipper. The other two compartments close with magnetic snap; one features two internal pockets and the other one an internal zipped pocket. 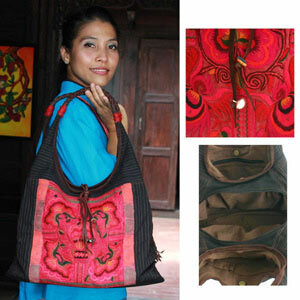 Braided leather handles complete the design.